There are many ways to financially plan and save to be able to send your children to college, but I have to raise a glass and recognize Robert J. “Matty” Matarazzo, who in 1984 decided to open a winery as a way to accomplish this. Four Sisters, an NJBIA member since 2002, is located in Belvidere, in the northwest portion of Warren County, and is part of a 250-acre farm that he tends to as a third-generation family farmer. And he has tended well, based on the success he’s achieved; the winery has received more than 100 awards at the state, regional and international levels for excellence for their wines, which include red, white, rose and fruit. I was very engaged in reading their website. Everything about it says, “Let’s have fun!” That seems to be the underlining principle of the activities and events that are offered. Take their “Ghost Stories and Dinners on the Deck” events for example. These start with a formal wine presentation and tasting, followed by a homemade spaghetti and meatball dinner. Then the fun begins with 90 minutes of ghost stories by noted writer and presenter Gordon Thomas Ward, a member of Haunted New Jersey, which investigates paranormal activities to both dismiss and support haunting claims. I could have sworn I felt a hand on the back of my neck when I read this. If hearing ghost stories is not for you, perhaps you’d like to participate in a “Murder Mystery Dinner?” Billed as “not a typical who done it,” it’s the guests in the audience who drive the amusing and weaving story line. This is also accompanied by formal wine tasting and dinner, along with a special serving of dessert wines. How about getting footloose with “Barefoot Grape Stomping?” Take off those socks and shoes, roll up your pants, and start stomping to the music. Wine and a meal are also included and you’ll certainly have a special picture or two to remind you of your day at Four Sisters. If sho wing off your pre-1990 vintage car, truck or motorcycle is your thing, you can participate in their “Bring on the Burgers and Cruisers” events and you’ll get a $5 coupon good for food or wine for doing so. The most special offering may be the most traditional one: “The Sunday Brunch,” which in addition to free wine tasting offers such delights as triple blend cheese and chive scrambled eggs, rosemary red roasted potatoes and a variety of fresh fruit, topped off with homemade coffee cake. Cherry Melissa (A blend of sour cherries perfectly balances with the sweetness of this wine). 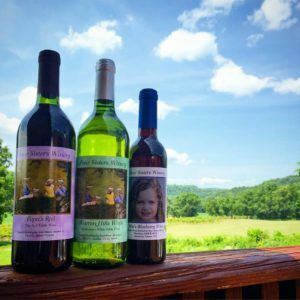 Congratulations to Four Sisters Winery and to Matty Matarazzo, who had the courage of a lion to put an idea into action and to then beam with pride 30+ years later with the collegiate achievements of all four of his daughters. Visit their social media sites at Facebook and Twitterfor more information. Four Sisters Winery is just one of 20,000 companies that comprise NJBIA’s membership, which is very diverse with representation from an amazingly large and wide spectrum of fields, industries and professions. Look for more unique stories about NJBIA members in future issues of “Beyond 10 West Lafayette,” NJBIA’s membership blog.